This part of ISO 22476 specifies the equipment requirements, execution of and reporting on borehole jack tests. NOTE This part of ISO 22476 fulfils the requirements for borehole jack tests as part of geotechnical investigation and testing according to EN 1997-1 and EN 1997-2. 7.4 Presentation of test results. ISO 22476-7 was prepared by the European Committee for Standardization (CEN) Technical Committee CEN/TC 341, Geotechnical investigation and testing, in collaboration with Technical Committee ISO/TC 182, Geotechnics, Subcommittee SC 1, Geotechnical investigation and testing, in accordance with the Agreement on technical cooperation between ISO and CEN (Vienna Agreement). The results of borehole jack tests are used for ground deformation calculations provided that the range of stresses applied in the test are representative of the stresses caused by the proposed foundation. Local experience normally improves the application of the results. For identification and classification of the ground, the results of sampling (according to ISO 22475-1) from each borehole are available for the evaluation of the tests. In addition, identification and classification results (ISO 14688-1 and ISO 14689-1) are available from every separate ground layer within the desired investigation depth (see EN 1997-2:2007, 2.4.1.4(2) P, 4.1(1) P and 4.2.3(2) P). NOTE This part of ISO 22476 fulfils the requirements for borehole jack tests as part of geotechnical investigation and testing according to EN 1997-1  and EN 1997-2 . This part of ISO 22476 specifies the procedure for conducting a borehole jack test in ground stiff enough not to be adversely affected by the drilling operation. Two diametral cylindrical steel loading plates are placed in the ground and opened by pressure. Pressure applied to, and associated opening of the probe are measured and recorded so as to obtain a stress-displacement relationship of the ground for the range of the expected design stress. This part of ISO 22476 applies to test depths of ≤ 100 m and to testing either on land or off-shore. NOTE 1 See Figure 1. NOTE 2 When testing in a borehole where the hydraulic head in the instrument supply line is likely to exceed the hydraulic head of the fluid in the borehole, consideration must be given to restricting the expansion of the instrument before it enters the pocket and at the conclusion of the test. For the purposes of this International Standard the symbols and abbreviations of Table 1 apply. 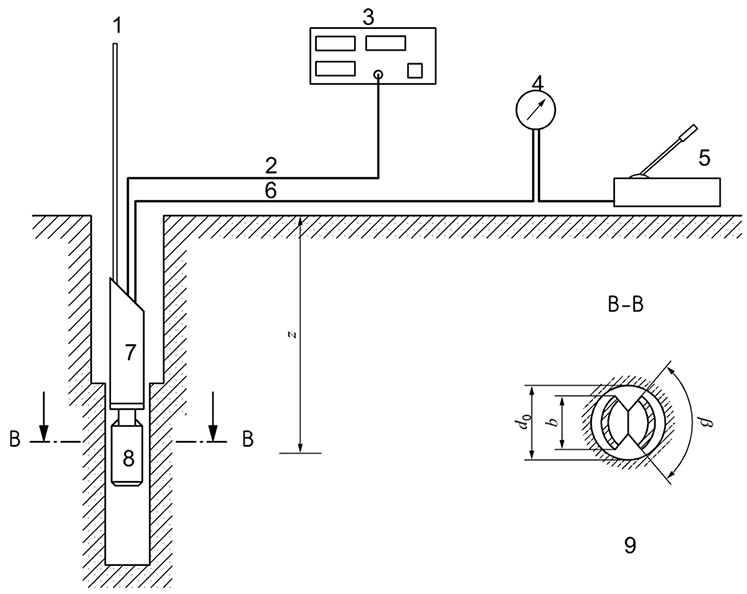 The principle of the borehole jack test is shown in Figure 1. The equipment to carry out borehole jack tests shall consist of the components shown in Figure 2.
setting rods (No. 1 in Figure 2). The nominal diameter of the borehole shall be some millimetres larger than the external diameter of the closed borehole jack. NOTE In the case of a borehole diameter of 101 mm, a borehole jack with an external diameter of 95 mm has been shown to be suitable. Annex A shows the geometrical parameters for various instruments. The hydraulic pressure applied to the jacking cylinders between the loading plates shall be measured by an electric transducer in the instrument (see Figure 3). The pressure may be recorded by a suitable measuring device at the ground surface. The expansion of the loading plates shall be monitored by one or more electric transducers. If the loading plates are moved by hydraulic cylinders connected in parallel, at least two such transducers should be provided so that any tilt of the loading plates is recorded. If the plates cannot tilt then a single transducer is sufficient. The pressure line and the signal cable shall connect the downhole instrument to the measuring and control units at the surface. The pressure line shall be connected to a hydraulic pump and a pressure gauge. The signal cable shall connect the transducers in the instrument to the measuring unit. If any part of the system is repaired or exchanged, the calibration shall be verified. A sample shall be recovered according to ISO 22475-1 at the test depth before the borehole jack test is carried out. In unstable boreholes, a casing with a suitable diameter shall be placed down to a level 1,0 m above the desired test location. A central hole or pocket of about 3 m in length shall then be cored at the nominal diameter for the instrument. The pocket shall be drilled and the downhole instrument shall be placed in the test location with the minimum of disturbance to the ground to be tested (see Annex E). Careful attention should be paid to the possible effects of any sedimentation in the borehole. The borehole jacking device shall be set into the pocket without delay. If necessary the instrument may be orientated in the pocket by rotating the setting rods. The instrument shall enter the pocket so that the upper edges of the jacking plates are at least 0,5 m from the pocket entry. The lower edges of the loading plates shall not be closer than 0,5 m from the bottom of the pocket. Borehole jack tests should not be carried out in ground where the stability of the borehole wall is not guaranteed. The maximum hydraulic pressure, qmax, to be used shall be decided considering the maximum stress expected to be applied to the ground by the proposed structure. tests in which time-dependent effects are important. These tests shall be individually designed according to the exact data requirements. In the first procedure, at least three unload/reload loops shall be carried out during the loading phase of operation. The programme for these unload/reload loops shall be either given by the specifications for the test or decided according to the observed progress of the test. The position of the first load reversal point has to be decided by reference to the initial contact stress (see 6.1.1). Before commencing the descent phase of a reload loop, enough time shall be allowed for time-dependent effects to become insignificant. When starting the test, the loading plates shall be jacked slowly until they contact the wall of the test pocket. This contact is indicated by an abrupt rise in the hydraulic pressure. This shall be the initial contact pressure, ps. 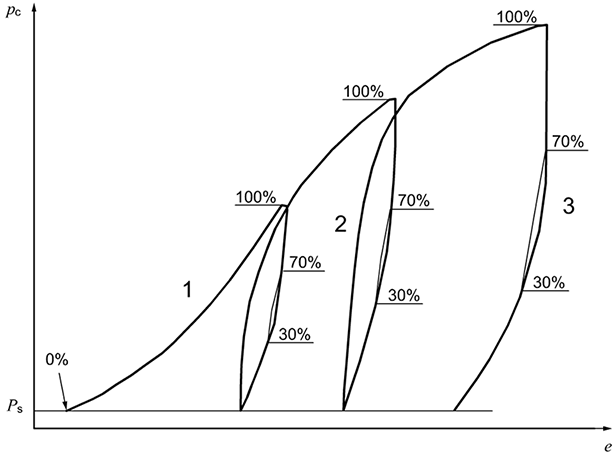 Further pressure shall then be applied until it equals qs, which shall be chosen between 2 % and 5 % of the planned maximum pressure (see Figure 4). Starting from this initial pressure, the soil or rock shall be loaded by stepped increments of pressure. The duration of these pressure holds shall be chosen to be between 1 min and 3 min. Simultaneous readings of pressure and loading plate expansion are recorded. Each loading phase shall be performed in five to eight increments. Before the start of each unload in an unload/reload loop, the pressure shall be held constant until time-dependent effects have declined to an acceptable value. Deviations from the test procedure shall be reported in each individual case and their influence on the test results shall be explained. After having reached the maximum hydraulic pressure of the loading phase, the load shall be decreased in steps with pressure and loading plate expansion being recorded. The hydraulic pressure in an unloading phase shall never fall below qs. The exact design of a reload loop shall either be given by the specifications for the test or decided according to the observed progress of the test. Sufficient data points shall be available in a reload loop to give a good definition of the whole loop. After completion of the tests, each borehole shall be back-filled and the site shall be restored according to the specifications given in ISO 22475-1.
ensuring the safety of the equipment. rc is a friction-effect correction which must be determined by a calibration (see B.4). NOTE Device specific factors/for instruments in use are given in Annex A.
EB is always specific to the stress range considered. The test data shall be plotted as shown in Figure D.1. The loading plate expansion, e, is plotted as a function of the calculated average contact stress, pc. The loading modulus of jack test, EB, shall be determined from the test data Δe and Δpc according to Formula (3). When evaluating borehole jack tests, Δpc shall only be selected within a range of any one loading or unloading phase. Whichever phase is selected determines whether the modulus measured is a loading or an unloading one. There is a further distinction between the first loading modulus and various reloading moduli (see Table D.1 and Figure D.2). All moduli shall be calculated and reported individually (Table D.1). Modulus values shall be reported to three significant figures. In the presentation of test results, the information should be easily accessible, for example in tables or as standard archive scheme. Presentation in digital form is permissible for easier data exchange. every table and every plot of test results. The field report, completed at the project site, and the test report shall include the information given in 7.2. The test results shall be reported to enable a third party to check and understand the results. During the test, particulars or deviations from this part of ISO 22476 which can affect the results of the measurements shall be recorded and reported. All graphical results shall be presented at a scale which results in the graph sensibly filling the space on the paper. 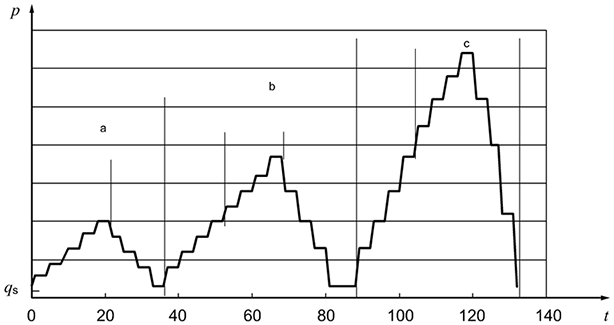 f) plot of the applied pressure, p, as a function of time, t (time-load diagram). The standardized dimensions of borehole jacks and related device factors are given in Table A.1. NOTE These factors were established from finite element calculations (FEM). For further information on the device factors see Bibliography  and . All the control and measuring systems shall be checked every time they are used. Full calibration against reference standards in accordance with ISO 10012 shall be performed before and after each contract. The resolution of the displacement transducer must be 10 urn or better. The allowable error is 0,5 % of the indicated pressure or 0,1 % of the full scale pressure, whichever is the greater. The hydraulic cylinders actuating the loading plates are subject to friction which reduces the forces acting on the ground. This represents a pressure correction, rc, which must be determined by a calibration. The instrument shall be supported vertically in free air and with the cylinders fully closed. The pressure shall be then increased gradually until the cylinders start to move. The pressure, rc, at which this happens represents the friction resistance and must be subtracted from all subsequent pressure readings. A check shall also be made that the friction effect at large expansion does not differ significantly from the value determined above. While the content of the report contains normative minimum requirements, the format may be freely chosen. The result of a borehole jack test is shown in Figure D.1. The corresponding moduli EB for the example test result are given in Table D.1. Borehole jack testing and borehole drilling shall be considered together. The quality of the borehole wall governs the quality of the test. In order to place the probe in the ground and to obtain valid borehole jack parameters, the drilling technique shall be selected by the operator according to the type of soil or rock (see Table E.1). If any other placing technique which is not included in Table E.1 is used, the operating organization shall be able to prove that the technique yields borehole jack results of satisfying quality. Borehole jack testing shall be carried out immediately (no more than 2 h) after the borehole pocket has been drilled and during the same working shift. Groundwater level, zW, shall be measured in the borehole pocket before placing the probe. It must be checked after pulling up the probe. For boreholes in weathered rock or stiff soils or when the boring is extended below the groundwater level, steps shall be taken to stabilize the borehole with casing and the pocket with drilling mud. The casing may be advanced by driving or by drilling to the desired depth, that is 0,5 m above the expected depth of the probe top. If the casing is driven, a driving hammer, a driving shoe, a driving guide, and an assembly to extract the casing shall be used. For drilling the casing into the ground, a carbide, saw tooth, or diamond casing shoe bit shall be used, depending on the geological conditions. In addition to the casing and shoe bit, a fluid circulation system shall be in place to remove material from the casing. After the casing has been placed, the borehole shall be clean. When a hollow stem flight auger is used for simultaneous drilling and casing of the initial hole, the auger end shall be kept closed. Great care shall be taken that the test pocket is not damaged by suction when the auger is withdrawn. inward yielding that occurs between the removal of the cutting tool and the jack placement. Inward yielding or swelling can be reduced by the use of an appropriate drilling fluid. The tool diameter shall not be more than 1,08 × d.
When selecting equipment for the site, several bits of various sizes should be available so as to adjust the size of the bit depending on whether overcutting or inward yielding occurs. When selecting the tool, important considerations are that the wall of the test pocket should be as smooth as possible and that the diameter di should be as constant as possible over the length of the pocket. If this diameter varies significantly, e.g. because of ravelling or if the pocket is not cylindrical, the quality of the test will be impaired. a Rotation speed should not exceed 60 r/min and tool size should give 2 mm to 3 mm radial clearance. b Not covered by this part of ISO 22476.
c Slurry circulation: pressure should not exceed 500 kPa and the flowrate 15 l/min. The flow may be temporarily interrupted if necessary. Since readings for pressure and displacement are either recorded manually or by transducers, it shall be considered that their resolution depends on either the display (data recorded manually) or the data logger (data recorded automatically). The minimum requirements for the measuring devices as given in Annex B shall be adhered to. It shall be considered that the accuracy of the measurements depends on the equipment and the type of measuring devices of pressure and displacement employed. The uncertainty, defined as the interval within which the true measure of the magnitude will be encountered, shall be calculated by reference to ISO/IEC Guide 98-3. The Ménard pressuremeter widely used in France is an example of a pre-bored device. 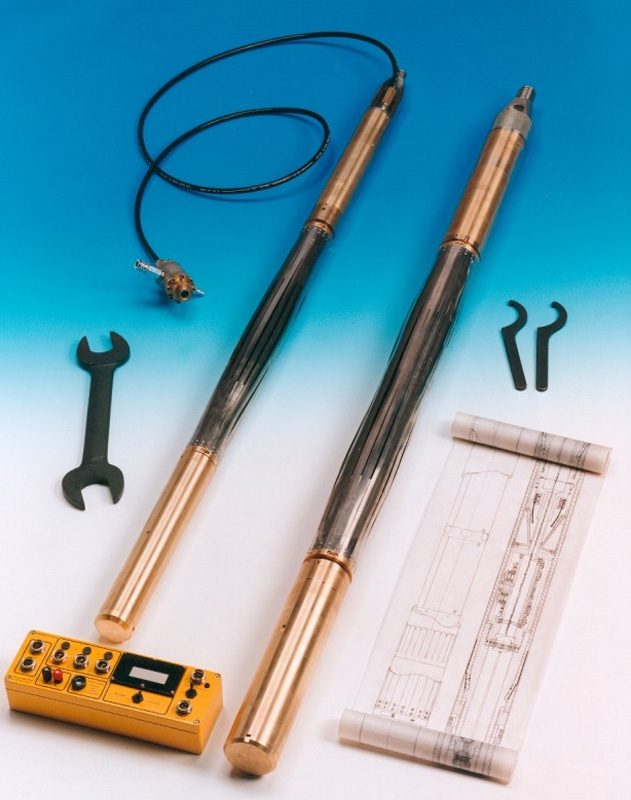 In the UK the High Pressure Dilatometer (the terms “dilatometer” and “pressuremeter” are interchangeable in this context) is available and is used in rocks, hostile materials such as boulder clay, and dense sands.